Consumer durable giant Lloyd Electric and Engineering Limited has roped in Tollywood superstar Mahesh Babu as its brand ambassador in India. The contract entails Mahesh to endorse the products of Lloyd through promotion, advertising and marketing. “Lloyd has been victorious in all its product categories, due to top-of-the-line features and superb quality. It has already proven itself as most reliable consumer durable brand and so, to be associated with it is indeed an honour,” said Mahesh Babu. Lloyd believes in providing the best products to its customers with its focus on innovations, superior technology and after sales customer support. “Mahesh Babu is inspirational and he ideally portrays a rare blend of talent, class, intelligence and popularity that complements Lloyd’s legacy and brand ethos. We are confident with the new media campaign with Mahesh featuring in it, will have a far-reaching impact which will further strengthen our positioning,” added Mr. Singhal. With its product portfolio including state-of-the-art Air Conditioners, LED TVs, Washing Machines, Refrigerators, Air Purifiers, Water Dispensers and Small Home Appliances, among others, Lloyd is a market leader in consumer durable segment. 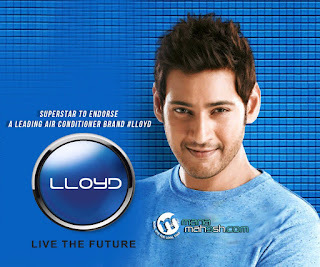 The association with actor Mahesh Babu will help Lloyd achieve its next phase of growth in South India. Moreover, the brand is looking to strengthen its pan-India presence on the back of the growing popularity of its state-of-the-art product range. As per the plans, the company is in the process of launching several new products in the coming months. Customer service has always remained a core value throughout the company’s most impressive journey to global success. The well-known KKG (Khushiyon ki Guarantee) process by Lloyd which lets a customer register a service request and receives a unique KKG number has already enjoyed rave reviews from its discerning patrons. Moreover, Lloyd is the only Consumer Durable brand in India which has launched a Service App for its customers. Paving the way for advanced digital connectivity with their customers and enabling a new form of communication format, Lloyd kicked-off a unique Smartphone App ‘MyLloyd’. Through this revolutionary App a wide array of innovative services and distinguished facilities offered by the company can be availed by a consumer with just a tap of a finger. About Lloyd Group: Founded in 1956, Lloyd has a true-blue lineage of nearly 60 years in high-end air-conditioning and electrical applications for sectors like railways, defence, mobile radar systems, malls, offices and multiplexes. Today, Lloyd Electric and Engineering Limited is the leading and largest producer of Coils / Heat Exchangers (Fin and Tube type) in India, serving the entire spectrum of HVAC & R industry in the country as well as OEMs in North America, Europe, Middle East and Australia. Lloyd acquired Luvata Czech, SRO facility in Czech Republic in May, 2008 to strengthen its European presence. Lloyd forayed into consumer durables a decade back, and today it offers a wide range of world-class products including Air-Conditioners, LED TVs, Refrigerators, Deep Freezers, Washing Machines, Air Purifiers, Water Dispensers and Small Home Appliances.